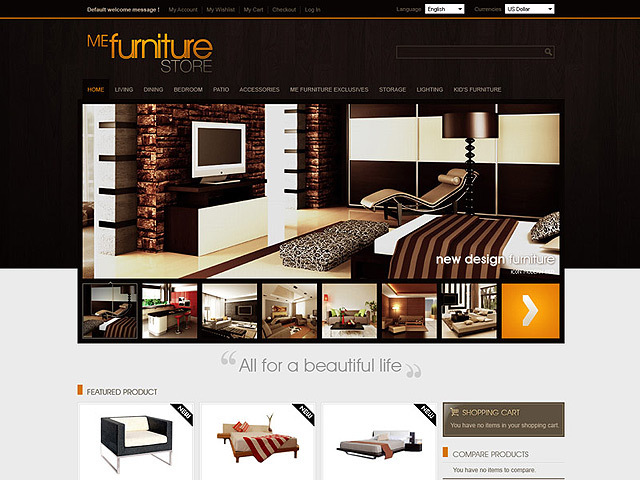 To start with, the Furniture Store magento theme has an extremely luxurious, clean and posh design, which together with its refined colour and appearance is very likely to boost your sales as well as become immediately popular among customers upon the launching of your site. 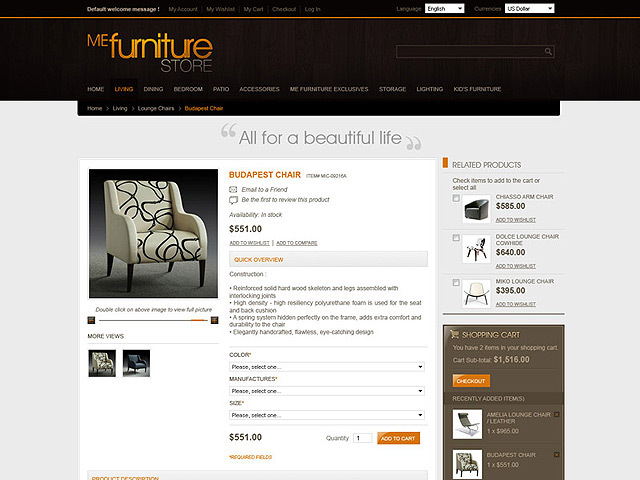 Furthermore there is a customizable slideshow included in the template which showcases all of your furniture products and the services connected to them. Additionally, all of the blocks on your site are meant to be changed and customized according to your taste and preferences so that the site will echo your dream shop. 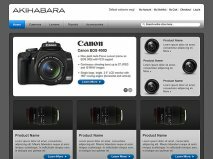 To add, as with all e-commerce sites, this templates offers cart zones and checkout progress pages that are essential for every online shop; besides you can make them look exactly as you picture them in your head. 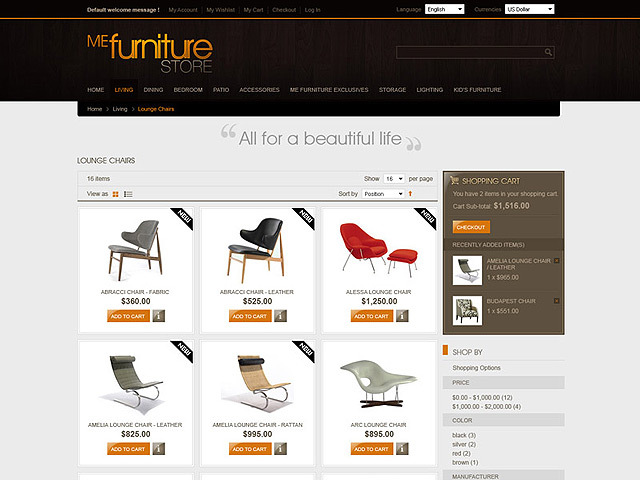 Moreover the Furniture template offers a customizable product catalogue page as well as banners for your furniture products so that you could advertise them even further. What’s more the template is cross-browser compatible so that you do not need to change the appearance for every consecutive browser; customers can view your page with IE 7, IE 8, Chrome, Safari, Opera, Firefox on all types of modern devices ranging from personal computers and laptops, iPads, smart phones, tablets and iPhones without any change in quality. Last but not least the template has the oh-so-needed SEO, which stands for Search Engine Optimization, so that your site could be easily spotted by all types of search engine programmes; besides the theme gives your newly-designed site the fast-loading option that every single user and client dreams of. 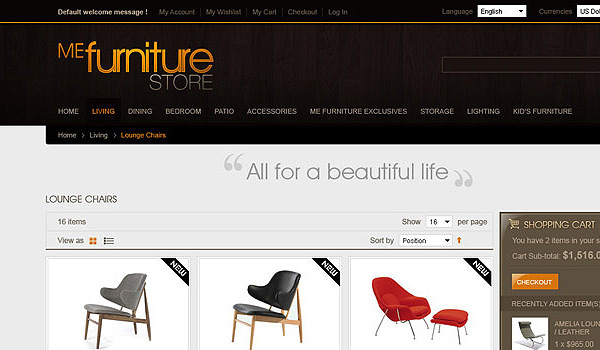 To sum up the Furniture Store theme offers all the needed features to help you create one truly stunning online shop site.